Me: Come on boys, please help me just a little longer. We want to have a clean house for Easter, don't we? Captain: Weeellll... It would actually be better if the house is messy. Captain: Well, then if it rains, there will be more places to hide the Easter Eggs in the house! 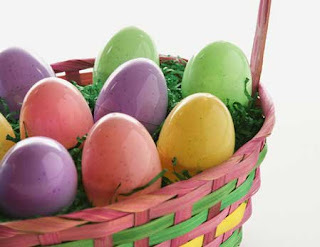 I ran across this link that lists 50 places to hide Easter Eggs (including 25 ideas for indoors). I think we will be just fine, even if we do get the house clean in time! I've never decorated Easter eggs before until my mom bought plastic eggs for me to decorate. And if you want me to bring them up with me so you can hide them I'd be happy to. I'll have no reason to keep them after Easter so let me know if you need them I have alot. I think we will be decorating eggs on Saturday Juliana, you'll have to come over and do it with us! !